Francis Burns, an Irish lad from County Longford, joined the British Army in 1825 when he was 18 years old. In the Army, he learned his trade of tailoring, an occupation that he followed on and off over the years after he left the service. His regiment, the 65th, known as the Royal Tigers, was stationed in Ireland until 1829 when it was sent overseas, to the West Indies and North America (Canada). The regiment served many long years on foreign soil, returning home only briefly to Ireland in 1843. Then, another long voyage, this time escorting convict ships to Van Dieman’s Land, in 1845. The Regiment was split into several detachments for the voyage, with Private Burns assigned to the Pestonjee Bomanjee. Also on board were Private William Sexton, his wife Mary, and newborn daughter. (Some dozen or more years later, Francis was to become Mary’s second partner). The convict convoy landed at Hobart Town on December 30, 1845, and soon after the soldiers headed back to Sydney to join the Levant, and the rest of the regiment in New Zealand. 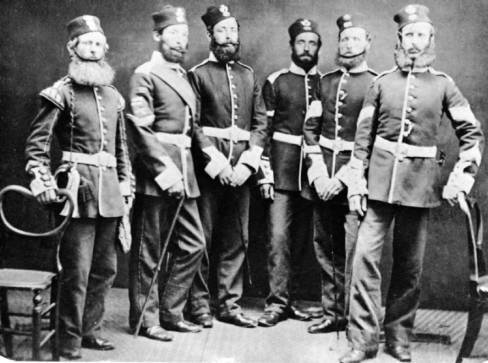 As the 1840s came to a close, it appears that the British Government was keen to cut back on some of its military expenses, and decided that such a large complement of soldiers was not warranted in New Zealand. A programme of encouraged discharges was undertaken, with soldiers being offered inducements to return to civilian life. After nearly 25 years in the service, Francis and William Sexton were among those to decide that life in Wellington away from the barracks, might be a reasonable alternative. Soldiers (names unknown) from the 65th Regiment, in New Zealand, at the time Francis was a Private in the Regiment. On his Soldier’s Discharge Papers, Francis was described as “5ft 9in tall with dark hair, hazle (sic) eyes and a sallow complexion”. It appears that Francis was illiterate, signing his discharge papers with an ”X”. With his Army pension of 1/- per diem and working in his old trade as a tailor, Francis settled in Port Nicholson (now Wellington). 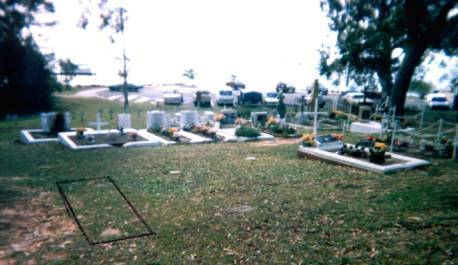 He is named in a list of jurors for the area in 1852. An 1852 New Zealand Government Gazette uses the spelling BYRNS, with an address in Hawkstone street, while the later lists (1854,’57,’58) use BURNS, in Tinakori Road. All give "tailor" as his occupation. In an 1858 electoral roll, his qualification is "Freehold, Tinakori Road", which is noted as his ‘Place of Abode’. By the mid-1850s, his fellow soldier-in-arms, William Sexton and his young family had also settled nearby in Tinakori road. It appears that at some stage after 1857, Francis became the de facto husband of William’s wife Mary (nee Wilson). The only mentions of Francis' marriage to Mary are on the death certificate of his (step?) 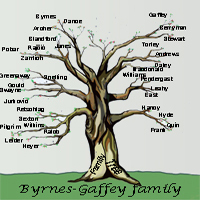 son James, which details James mother’s marriages to William Sexton and Francis Byrnes, and Mary’s own death certificate, both of which are vague on details. However, Mary was never free to marry Francis – William still lived on, for more than 2 years after her death. The Wilson-Sexton-Burns trio gives rise to some speculation. The 1857 birth certificate of the youngest child Mary Sexton had in Wellington, New Zealand (with William Sexton as the father of record), is for a son named James - and Francis Burns’ son James always claimed he was born in Wellington, New Zealand, around the same time, also to Mary Wilson. Following DNA testing of the male descendant line in 2018, it seems that Francis was in all probability, James’ biologicial father, with James taking his Francis’s surname (albeit with a change of spelling). According to his British Army pension records, Francis moved to Australia in mid 1859 and his new family settled in Queensland (where Mary died just a few years later on a remote property 200 kilometres northwest of Gayndah in 1864). How the family came to be on the property Rawbelle, is not known as the station's records were destroyed by fire in the 1970s (although Francis probably worked as a shepherd there), but his name and occupation of tailor are clearly listed on Mary's death certificate, filed by the manager of the property. In the mid 1870s, Francis went to live with his step daughter, Sarah Sexton and her new husband, a printer, William Smith, in Toowoomba. According to early Queensland electoral rolls, Francis lived with Sarah and William in their homes around Toowoomba, firstly in Philip Street, then for more than 10 years in Kent St. However, by 1889, he had moved away from the Smith family, taking up residence for a short time in Hume Street. For many of the earlier years at least, it’s probable another member of the Smith household was Francis' son James, who, like his brother-in-law William, went on to become a printer by trade. The next official record of Francis is in 1891, when he was transferred from Brisbane Hospital to the Dunwich Benevolent Asylum on Stradbroke Island on February 18. His admission records note "he has been unable to work for two years" (at the time of his admission to Dunwich, he was nearly 85 years old!). A couple of interesting points in the Dunwich Benevolent Asylum admission records which tends to confirm the speculation above on Francis’ family - he is recorded as never having married, and therefore no children are listed, and that he had “no relatives, no cash, no property” in the Colony. However, in a handwritten note possibly added later (after his death) a name was written on the record: "Jas. Burns, Govt. Printing Office”, thus clearly establishing the link with his son James. (The Government Printing Office was where James worked). Francis' admission to Dunwich, and his subsequent death certificate give his mothers name as "Mary Tenion", but his likely baptism registry says "Anne Fennan" (the handwritten surname of Francis mother is very hard to decipher, both on Francis' baptism entry, and his parents marriage register. Fennan is said to be relatively common name in the Longford area. Francis’ Army discharge papers (WO 97.782); Ireland, Catholic Parish Registers, 1666-1915, Ardagh, Templemichael, 1802-1829, pg 29. New Zealand Government Gazette. - Wednesday, February 11, 1852, Jurors' List for District of Port Nicholson for 1852; Thursday February 9, 1854, Jurors' List for the District of Wellington, for the Year 1854; Wednesday, February 4, 1857, Jurors' List for the District of Wellington for the year 1857; Thursday, February 4, 1858, Jurors' List for the District of Wellington for 1858.
 as above in New Zealand Government Gazette and death certificate, and son James' marriage certificate. See War Office records, correspondence between the Duke of Wellington and Earl Grey, WO 43 876, which sets out the reasons and the pension entitlements for such discharged soldiers. Hugh and Lyn Hughes, Discharged in New Zealand: (a record of soldiers of the Imperial Foot Regiments who took their discharge in New Zealand 1840-1870), New Zealand Society of Genealogists Inc. 1988. [10 The Army records use both the “Burns” and “Burnes” spelling.